- Start having the best s'mores parties! Everyone will talk about your sticks! - Make your family memories special! - Make your kids happy, roasting their own treats! - We have the best customer service! Read our customer reviews. Our main goal is making our customers 100% happy. That is why your new marshmallow roasting sticks come with 100% warranty. - We use the non-toxic 18/8 304 stainless steel to ensure no rusting & highest durability. - Our sticks are long enough when extended to be safely away from the fire, and very compact when collapsed and stored in their bag. - Easy to use, easy to clean, easy to store! CLICK "ADD TO CART" & BUY NOW! ✔️SAFETY FIRST - With these extending Marshmallow Roasting Sticks, you can ensure that your child is always at a safe distance from fire, while roasting Marshmallows and hot dogs. In this new model, we also created NON-SHARP tips, to prevent children from being injured. ✔️ PREMIUM QUALITY, UNIQUE DESIGN - These Marshmallow Roasting Sticks are made of Non-Toxic Heat-Treated FDA Approved 304 Stainless Steel. They can hold up to 1.43lbs on its extended position without breaking, and very easy to clean! The rubber handles with finger indents, give you a comfortable and steady grip. We created the perfect distance between the prongs for best roasting results. ✔️ BEST CUSTOMER SERVICE! LIFETIME GUARANTEE! - Our primary goal is to make our customers 100% happy. That is why your new Marshmallow Roasting Sticks come with 100% warranty, for peace of mind. Anytime family is dedicated to address any service and product issues. If you're not satisfied with the performance of your roasting forks, we will refund your money or replace it for you, no questions asked! 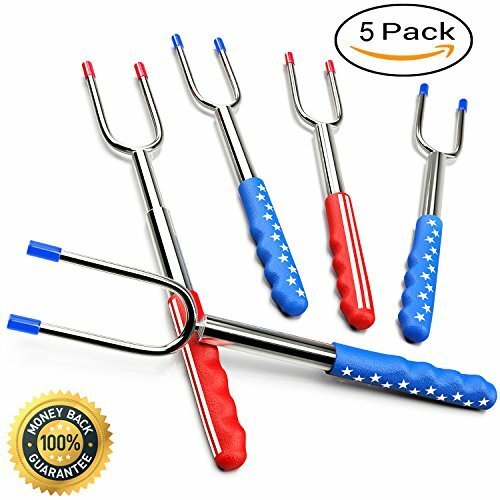 ✔️ BONDING EXPERIENCE AND QUALITY TIME - 6 individual Marshmallow roasting sticks with 6 different colors, allow your family to roast their treats around the campfire together. With The unique design of your new Telescoping Skewers, you will find out how to roast your marshmallows just right, every time! So, if you and your family love Marshmallows and s'mores, those Telescoping Skewers are just for you! You can also use it as hot dog forks on your next fire pit. ✔️ EASY TO CARRY, EASY TO CLEAN - Our telescoping marshmallow sticks come with a free beautiful "jeans style" canvas bag, so you can easily take it with your campfire and camping cooking equipment. Cleaning the roasting sticks is very easy! You just need to put the tips in a glass of water for about 15 minutes. It is a very SPECIAL GIFT for friends and family! Now you can easily make your loved ones happy with those campfire sticks! If you have any questions about this product by anytime family, contact us by completing and submitting the form below. If you are looking for a specif part number, please include it with your message.